Your resume is a critical tool that introduces you to a potential employer and gives them the confidence to invite you to the next stage of the job hunting phase, the all important interview. It’s critical that you your resume demonstrates your skills, strengths, expertise and experience in a powerful manner.A targeted resume will help you achieve your ideal job! 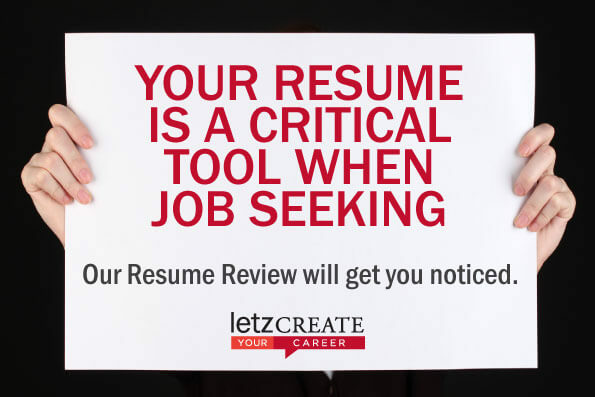 For a limited time, Letz Create is offering a Resume Review for only $49 which includes having your Resume reviewed by a leading career coach as well as a 30 minute feedback session so you know exactly what you need to do to seal your job!